I started hunting 10 years ago in 1993. My first “big game” hunts were for spring turkey and archery deer and javelina. My first year proved fruitless, but with some buddies’ help, I got lucky in the 1994 H.A.M. 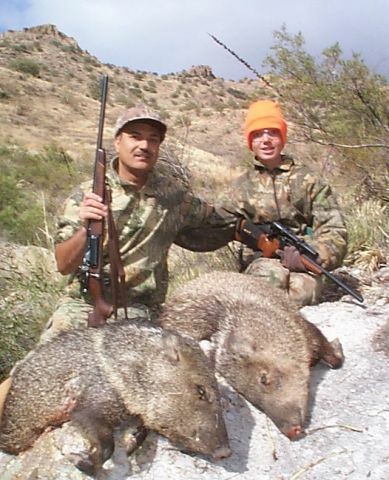 (handgun, archery, muzzleloader) javelina season. For the next six seasons, I continued hunting javelina, sometimes with others, sometimes alone, but without tagging another pig. In 2001, I started hunting the rifle season with my oldest son Bennet, who completed Hunter’s Ed and turned 10 that year. What a disappointing hunter-father I must have been to the poor lad. My pigless-streak continued as we brought home unused tags in both 2001 and 2002. A visit by an angel would make 2003 different though. We left home on Saturday, the second day of the season, heading for my favorite southern Arizona hunt unit, 36B. 36B is a fantastic whitetail unit, but a rather a so-so unit for javelina. Most of the unit is at around 4000 to 4500 feet in elevation, a little higher than pigs prefer. Nevertheless, I had run across a few javelina in the areas that I haunt when questing after whitetail. I’ve hunted this unit a LOT in the last 10 years, so I know the unit very well. 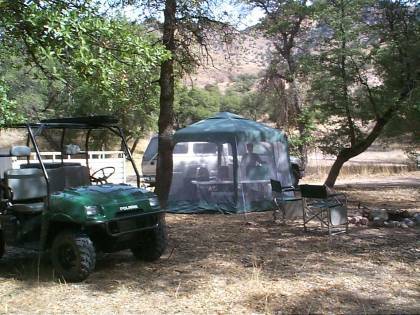 For a camp spot, we found a beautiful little spot in a grove of oak trees, right off the main road. This camp is one that in the past, was always taken early. But here it was, the second day of the season, and it was still available! I started to wonder whether most of the other 398 tag holders for this unit had decided not to hunt due to the weather report. We were scheduled to get a good dose of rain Tuesday through Thursday, the last days of the hunt. Still, that left four days at the beginning of the hunt with fairly nice weather. So where was everyone? Our camp accommodations consisted of sleeping quarters under the camper shell in the back of the pickup, and a Coleman screen house where we set up our kitchen. By the time we set up camp, darkness was falling, so we really did not get to hunt Saturday at all. Our first day of hunting would be the third day of the season, Sunday. It was this hunt, in this unit, last year, where the idea crystallized that, “I need an ATV.” The result of that thought was the Polaris Ranger 4x4 utility vehicle I purchased last summer. I’m in debt up to my ears now due to that purchase, but I’ve been having so much fun with this little buggy that I almost don’t notice the financial strain that it has placed on my allowance. I must admit that the first couple of days we could actually hunt on this trip were not spent in hard-core hunting mode. Ben and I were having fun Rangering around, seeing some great country on roads that I had never taken before. I had never taken these roads before because I was plumb too scared to, with a full-size pickup truck, even with 4WD on that truck. The little Polaris, with 4WD and a locking rear differential, just walks up very steep, narrow, and rutted inclines, without much wheel spin or any other kind of hysterics. Great fun, and it sure beats walking! Oh, of course, we stopped at various overlooks and glassed around, but it was always too easy to say, “OK. Nothing here. Let’s go somewhere else.” Yes, I did recognize a certain laziness taking over. We also parked the Ranger a couple of times, and took off on some good long hikes. But by Monday afternoon, the weather was starting to move in. The sky started getting increasingly grey, and the wind was whipping up. Moisture started spitting out of the sky into our faces and the temperature was dropping. 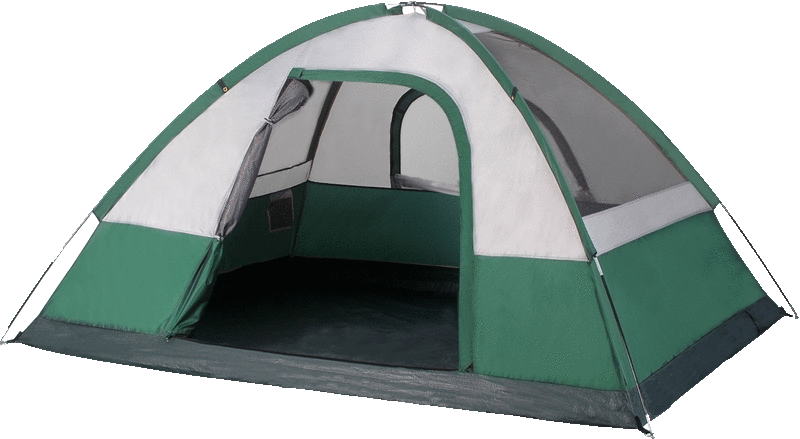 That evening, I unpacked 5 tarps and tied and duct-taped them over the windows of the screen house. We would be needing the extra protection over the next several days. Under threatening skies on Tuesday morning, Ben and I made sure that we packed our rain gear and headed to the area that I knew pigs were likely to inhabit. We parked the Ranger near the top of a hill overlooking the tank where my brother Tony and I first spotted the herd that buddy Dave took his javelina from in 1996. We started by slowly hiking down to the tank, keeping a wary eye all around as we walked. I pointed out to Ben the significant spots in the landscape from past hunts. There was the fence that I crossed when stalking the pigs in ’96 with my muzzleloader. I left my possibles belt with reloads for the muzzleloader, and more importantly, my Ruger Blackhawk, behind at the fence when I crossed. I thought, "Who'll need a second shot when this big .54 caliber lead ball slams home?" But when my chance came, I MISSED! So there I was, standing around with an empty pipe while the pigs ran right past me. And over there stood Uncle Tony who fired on a pig on that slope with my 7.62x39 AR-15. At the shot, the pig dropped down to the bottom of the slope into the gully. Tony raises his hands into the air triumphantly, "He shoots, he scores!" Only when he got there, there was no pig. Tony said he saw a pig high-tailing it out of the gully, but because he lost sight of his pig when it dropped, he figured that the running pig was just another herd member. I had plenty of Unit 36B stories to tell Ben, and he soaked them all in. We found no sign at the tank, so we proceeded to slowly make a circuit of the area. Next stop: Piggy Playland. I had found pigs at this spot on my first hunt here in December 1994. Of course this was deer season, so all I could do was sit back and watch the antics of the herd. This included several young'uns who were making quite a squealing racket as they ran around chasing each other. Nope. No piggies at Piggy Playland in 2003. We eventually got back to the Ranger around lunch time. We saddled up and headed back to camp which was a quick run only about two miles away. After lunch, we headed back to the same area, but this time our plan was to simply sit at the top of the hill overlooking the tank, and wait. With the weather worsening, it now seemed more prudent to find a good, Ranger-accessible vantage point, and just glass. That way, if the skies were to open up in a big way, getting back to shelter would be pretty quick. And it did rain on and off for the rest of the day, but nothing major. No javelina sightings either. That night is when the real rain began. It wasn't a deluge, but it was a solid rain that lasted all night long. Ben and I were snug as a bug in the back of the truck, but I told him, "If it's still raining in the morning, we're sleeping-in, bud." It was, and we did. We did get out for a couple of short hunts on foot that day, but the rain kept us pretty close to camp. I got a good long afternoon nap though! It is now Thursday morning, the last day of the season. It is also, "Krag-Day". I have a few firearms - and most of them want to go hunting. I brought along 5 for the trip. The first couple of days I hunted with my Russian Scout rifle. Every day, I packed a polymer frame EAA Witness auto-loader in .40 S&W on my hip. When I got tired of hauling around the weight of the Scout, I broke out the Lone Eagle single-shot handgun in .44 Magnum. On the rainiest days, I toted my synthetic-stocked .243 Browning A-Bolt. I saved my walnut-stocked, sporterized Krag carbine for the last day. Ben hunted with his TC Contender carbine in 6.5mm TCU. The skies were a 50-50 mix of blue sky and moist swift-moving clouds on this last day. The plan that morning was to head to the most likely area that I knew of, so it was back to the area of the tank and Piggy Playland. The main road is cut right into the side of the big mountain in this area. We made a high circuit of the Piggy Playland area which allowed us some good glassing views toward the brushy bottoms of the tank and Piggy Playland itself. Though we were high, the main road just to our east was still higher. When we made our third stop to glass, I pulled out my binoculars and suggested to Ben that it might be a good idea for him to pull out his binoculars too. I had given him an old set of compact binoculars that I no longer used. They reside in a belt pouch for easy access. The only problem was that the belt pouch was now open, and empty. "You lost them?" "They're probably back at the rock where I was glassing." "What rock? Where we just came from, where we were having some snacks?" "No. The one before that." I was fuming. We did not immediately go back to look for the binos. We continued our circuit, and eventually started heading back in the direction of the Ranger. When we got to the top of "Coyote Hill", marked by a dead tree, we could see the first rock about a quarter-mile away. I sent him off with GPS and FRS radio to go look for the binos, while I waited at the top of Coyote Hill. He reported that he could not find them at First Rock. The hunt had degenerated from a hunt for javelina into a hunt for binoculars. Over the radio, I asked him whether he thought he could find his way to the second rock on his own. "I think so." "Then I'll meet you there." I soon caught up with Ben at Second Rock. We searched there for a while, still coming up empty-handed. "Well, that's it. They're gone." Sullenly, we walked back to the Ranger, and rode back to camp for lunch. Ben's rifle is a G1 Contender carbine from the TC Custom Shop, chambered for the 6.5mm TCU. As a Custom Shop Contender, the frame is slab-sided (no cougar engraving). With a youth-length stock, and a custom length 18" barrel, the rifle is a very short 31" in overall length. 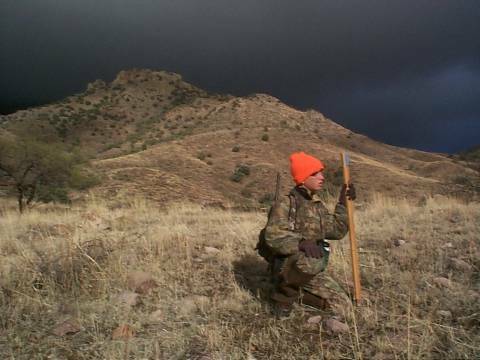 It's hard to imagine a more perfect rifle for a young boy's javelina gun. Like the more popular 7mm TCU, Ben's cartridge is based on a necked-up and blown-out .223 Remington case. Ben is a bit recoil shy, so I download for him using 16.5 grains of Accurate Arms XMP-5744 topped off with a 100 grain Nosler Ballistic Tip bullet. This load yields around 1900 fps out of Ben's barrel for a muzzle energy of around 800 ft-lbs. I originally ordered the rifle for Ben with TC peep sights, but we found that he shoots better with a low power scope. For the last 3 seasons, Ben's Contender has been wearing Grampa Rex's old steel-tube Texas Weaver K3 (fixed 3-power). I wrote about this rifle a couple of issues ago. Since then I have verified that the rifle was originally manufactured in 1901, making it 102 years old this season. The rifle has been fitted with a Lyman Model 57K rear peep sight and a Lyman sporter front sight. According to the previous owner, it has been wearing the current walnut stock for the last 15 years or so. It was his Dad's for as long as he can remember, which takes it back at least 40 years in his family. My load for the .30-40 Krag cartridge is 38.0 grains of IMR 4320 under a 170 grain flat point. Flat points in this weight are available from several bullet-makers and are actually designed for the .30-30. I haven't chronographed this load, but book specs would place it around 2150 fps - right at the top, or maybe a shade hotter than .30-30 specs for this bullet weight. The books say that I could probably get another 100 to 200 fps out of this bullet weight, but I don't feel compelled to push this old rifle hard. This load feeds beautifully from the Krag magazine with an overall length of 3.00 inches. I've had problems feeding light (short) spitzers from the magazine. The Krag feed system was designed for long and heavy round nose bullets. After eating lunch and refueling the Ranger, the plan was to head to an area five miles in the OTHER direction, since it was looking increasingly unlikely that we would find any pigs in the traditional area. Ben was already sitting in the Ranger and I was zipping closed the screen house on the way to the Ranger when we heard an ATV coming down the road. The rider pulled into camp and started making small talk. "Hunting pigs? Seen any? This really isn't a very good unit for pigs, is it? I've only seen one. Hey, you were hunting up the road this morning, weren't you? I recognize the kid's orange cap. We were watching you this morning from above. Looked like the boy was making a stalk." "Yeah, he was stalking binoculars. No, we haven't seen any pigs, and this afternoon is our last chance." "How do you like that thing?" (pointing to the Ranger) "Man, I love it. Goes just about anywhere." "What kind of an engine does it have?" "It's got a 500cc single." "Same engine as this one?" It was only then that I realized that he was sitting on a Polaris Sportsman 500. "Yeah, same engine!" "Yeah, I only saw the one pig, about an hour or two ago, actually - You know, he was only about a mile south of where you were this morning." "Really? Did you go after him?" "Me? Naw. I'm out here hunting lion. I could show you, if you want." "Sure! Lead the way!" We followed him up the main road, past our area until he got to the spot that he spotted the javelina from. "See that lone tree down there? The pig walked down from there into that canyon and disappeared. I bet you he's still around. I would sit up here and glass for awhile, and I bet you'll see him again." "Thanks man!" I stuck out my paw to shake his hand, but he was looking the other way and didn't take it. I said thanks again, and hopped back into the Ranger and motored around to a faint short trail that led off from the main road. Our fellow Polaris man rode off. Where we parked, we were about a quarter mile away from, and about 160 feet higher than the canyon bottom our friend had pointed out to us. There were two rocky ledges on the slope between us and the canyon bottom. We walked down to the first, higher ledge and sat down to glass. Seeing nothing after glassing for about half-an-hour, I asked Ben if he thought we should go down one level to the next ledge. He agreed and down we went. We sat there for about another 45 minutes before I spotted a pig coming back upstream at the bottom of the canyon. "Ben! Ben! Take a look!" About 1 minute later, piggy number 2 comes into view, and 30 seconds after that, piggy number 3. We were about 200 yards away. I told Ben to start packing up his daypack and to put it on. I noticed he was shaking a little. "Are you scared?" "No, just a little cold." We worked our way down the slope and across a side-draw until we were about 40 yards away. They were just off the bottom on the opposite slope. They were so busy abusing the shindaggers, that they never noticed us. Shindaggers are a small agave-type plant with very sharp points growing just high enough to stab you in the shins as you walk through them. They were pulling leaves off the spiny plants and eating the fleshy part near the base of each leaf. When they would finish up the leaves, they ate the heart out of the plant just as if it were an artichoke. Ben and I came to agreement on who would shoot which pig. He chose the light-colored one. I told him that I would wait to shoot until he shot first. He sat down on the slope and deployed his shooting sticks. I moved off about 15 yards, knelt down, and started peering through the Krag's peep sight. Before each hunt for the last three years, I would take Ben out and have him practice on a javelina target. He knew where to aim. I had him practice at ranges up to about 50 yards. I had made him a set of shooting sticks custom made to his size. If he remembered to concentrate, and to sque-e-e-eze the trigger, not close his eyes and yank, he was quite capable of putting that bullet exactly where he wanted it. It seemed like I had that front sight plastered on my pig for a long time, but in reality, it was probably only about 30 seconds. I heard Ben's rifle go off, and out of the corner of my eye, I saw Ben's pig go down immediately and fall to the bottom of the draw. Oh yeah, it's my turn now! I finalized my aim, and about two seconds later, the Krag fired. My pig was hit, but still on its feet. It was wobbling around a little, and there was some "stuff" poking out of its side. I jacked-in another round and fired again. Still on his feet! I cycled another round and fired again. Still standing! But in a moment, I saw my pig too, slide down to the bottom of the draw. Out of the three pigs, there is one very lucky one, still wandering around out there. We found the two pigs lying in the trickle of water at the bottom of the draw with only 1 foot of distance separating the two. Ben's shot was perfectly placed. I was impressed by how cleanly his relatively low velocity, light weight Ballistic Tip dispatched his critter. My shot, on the other hand, hit a little too far back. The Krag threw a thick-enough, heavy-enough flat point slug, so even the bad hit made the piggy too sick to scamper off. Of the second and third shots I fired, one grazed a knee, and the other apparently missed. So was that guy on the Polaris for real? He said he was watching us earlier that morning from above. He didn't take my hand to shake it when I offered it out. Remember that we had seen few other hunters during the whole trip. For sure, we had never seen him before he motored up to our camp, at the exact moment we were about to leave to head in the opposite direction! -- at the exact moment that it would have made a difference in making the hunt another Martinez skunk-out, or a success. And after he motored off, we never saw him again. By following his suggestion of glassing and waiting, the pigs materialized exactly where he said they would. Could it be, that we were actually visited by an angel?